We’ve done this all with 3 staff (our 3rd joined last year) and a great volunteer team. It has been truly a wonderful experience being a part of HDYO and watching it grow. Having founded HDYO it’s beautiful to see this creation do good for the community I hoped it would help. No matter what happens in the future I will always be so happy and proud when I think about HDYO and what it has achieved. 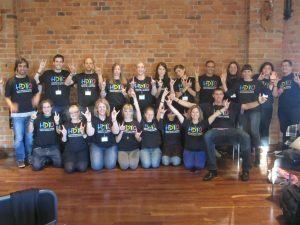 Thank you to everyone who has been involved in HDYO and to everyone who has attended a camp or asked for support, we love being able to help young people impacted by HD and we are just as passionate to reach as many young people globally as possible as we were at the beginning.